Companies would benefit from innovation talent development that is multi-faceted and whose effectiveness – and innovativeness in itself – can be measured and mapped . We present such a program in terms of a swimming “workout” consisting of 18 Laps. We use a water and swimming metaphor – rather than a linear golf metaphor, say – because we believe that water and its ripple effects are apt for portraying the multi-dimensional process that is innovation. Each of the 18 Laps is an effort to learn how to apply levers to everyday activities in order to unlock innovation. Those swimming drills are egged on by coaches. A complementary hack –18 Black Holes – is more thinking-oriented and considers multiple dimensions to stimulate innovation. We use an "augmented reality / augmented vision" analogy with multi-universe theories, as brain-crackers.Business reality around the surface in "18 Laps".Vision in depth and boundless mind scope in "18 Holes". Knowledge comes from experience plus thoughts. Co-Operative intelligence is our engine of choice stretching the lines and limits of the three. This story is based on the experience of a veteran in a technology industry (whom we call Freestyle John Linchpin) who was developped in the course of innovation projects at his company. Each Lap refers to one real case or more, while names have been sometimes changed. Essilor Int. grew from 5K to 50K employees during the 20-years time period covered by the experience, and went from regional to global scope. 4 CEO's did operate by duets or trios along succession planning, while strategy was straightforward and consistent. Innovation is one sustainability strategic pilar among others, while receiving media exposure in recent years. The company does not have an innovation talent development path per se.It is no yet deliberate talent development path designed by some creative HR, R&D or COO individuals or committee with a company wide innovation driven agenda. We wish to be a source of inspiration and force of proposal in that respect. Real field experience is analyzed as a stand-alone testimony through a chain of 18 laps. However, smart MIX-readers will also find out a series of related stories and hack. as despite time pressure we managed to ship this extra material (in the sense of Seth Godin's Linchpin...). Co-authors belongs to different business units of the Essilor International organization and eco-system. Three are engaged into academic research programs around Innovation (X Paris-TechMaster PIC ) , Knowledge Management (Bangkok University PhD) and challenged by tutor about co-operative intelligence in its stretched dimensions. Co-authors never all met. Not a single team or project meeting have been held. Neither kick-off ceremony nor milestones briefing. No bureaucracy have been created on the top of the pre-existing constraints of the tools, format, and timeline by the MIX challenge. All have been selected and approached , because of their diverse skills or background, and a consistent attitude toward the concepts and reality of contribution and innovation, already expressed in communities within the LOFT eco-system, and recognized as Linchpins by the author. No global agenda or any project plan have been provided. Each entered the pool at a different step, therefore with a different dead-line pressure.We worked as a community, with an open source mode. The chain of stories and hack is a live demo of stretch goals, rapid prototyping and shipping by a (lean and daring) community of passion at work. A kind of "story in the stories, hack, laps and holes" and augmented reality bonus exercise of the core input.Also a proof of concept experience within the challenge of all proposed solutions. Abundant food for thoughts we wish. Young recruits joining innovation projects at the company feel like they are scouting on a “Terra Incognita,” as draft maps provided during the very limited induction path do not represent the territory encountered. A need is recognized for a road-map to encourage innovation, with innovative grids for managing above the over-simplified urgent versus important rule, not applicable any longer in today’s community world. Second, a need for the innovation path to be multiple was recognized. Few companies organize to pursue multiple paths (such as walk, run, bike and swim) to cross-invent themselves, however. It is difficult enough to engage in change initiatives?, for transitions are moments where you lose time at? start. When on innovation winding trails, roads and waters, young impetuous and furious start-ups aim at getting on the one and early grown skill or product to speed up delivery. So they stabilize and specialized in one single discipline and fast-track distance. Third, few companies set up the environment for individuals to recycle their talents and personal creative process. They neither train them as multi-discipline innovators, nor build a complete team covering all disciplines and events. Most hire talent for specific skills, to be immediately used on recurrent issues, or to maintain successful processes. External, fringe benchmarking can be a powerful aid: advanced managers would be inspired to benchmark the dedicated and innovation-oriented community of tri-athletes. A quote by Master Coaches (from the pool of talents) is that core basics for this industry require "5 years to learn how to float". Plus another five to glide.This is the rational behind veteran Linchpin using swimming work out metaphor. We think it is worthful to provide "innovation muti-drill training tactics" to all volunteers as it is no walk on the beach , from rookies to veterans.Same for coaches as walking on the bank of the talent pool requires sharp attention and data capture. Warm-up time is over ....time to get wet ! Many would prefer “18 holes” for a title and the story to lead through a nice golf course. Appealing outdoor exercise, concentration and precision skills development drive, diversity in landscape, time for mind computation. Sorry, the journey is quite more repetitive, breath-taking, but without gorgeous scenery. More like some raccoon race against the clock. And bouncing back and forth on opposite walls. Furthermore, core trade basics require “5 years to learn how to float.The progression of innovation training goes from swimming in an indoor pool to open water. Few companies organize to walk, run, bike and swim multiple paths to cross-invent themselves.It is not innate and remains difficult to engage in change venues, for transitions are time consuming moments as a start.But it is not easy swim with shoes (fins: OK), and you cannot ride without (fins : KO). See the power of external, fringe benchmarking : advanced managers would be inspired to benchmark the so dedicated and innovation oriented community of swimmers and tri-athlets. When on innovation winding trails, roads and waters, young impetuous and furious start-ups aim at getting on the one grown skill or product to speed-up delivery. So they specialized on their early discipline and fast-track distance. Likewise few companies set up the environment for individuals to recycle their own talents and creative process. Companies rarely train multi-discipline innovators, Neither do they inherently expose swimmers to different styles. Or build up an exhaustive team covering all disciplines, styles, distances and events. Designing an innovation training map, with innovative challenging MIX ideas is a power of 2 tactic. Most hire talents for their specific skills, to be immediatly operational on recurrent issues, or maintain successful processes. Over-maintenance and comfort zone may lead to the exact opposite of sustainable contiunous improvement : loss of momentum and finally side fall, roulé-boulé or drowning.Somehow counter-intuitive for traditional engineers. We interviewed a guy we define as a manager, veteran in a technology industry, who experienced laps race kind of training through swimming projects events into the innovation pool of the same company (namely Essilor International and the ophthalmic industry, a starting benchmark helping to transpose in any sector). Sometimes hot and troubled, sometimes chilled and clear waters.Some kind of initiatic workout for innovation talent development. Experience is 100% facts and field based. It is proposing an original check of a global ratio of such multi drill along the "18 pink squares leads" proposed as a baseline by the Innovating Innovation challenge Mavericks team. With the constraint to remain anchored into the reality at that stage. Laps are looked as a succession, like incremental steps of each square lead. Laps can be done within different lanes.Moving from one lane to another is a leap. We are observing and questioning on or just above or under the surface of the water, a kind of 2+ dimensions framework, reason for shortening as the "Innovating Innovation"= "In squared" ratio) . We identify a multi-years progression along 6 lanes of forces, helping individuals to move from one group to the next, while pursuing the acquisition of basic to advanced skills through the 18 laps set of drills. So lanes now are additional forces helping to move by leaps.That is to say not incremental progress but higher steps, discoveries of new sensations, techniques or opportunities, new directions.Such leap happens without notice during training or competitive events.It is a maturity step.A kind of blooming. Get "innovactive" and dive into funding fresh accomplishments. The square surface gives the company the first level frame for well structured hard workout. Like doing laps in a competition pool, with minimum drift, millimetric adjustment to clear targets. Waves are minimized, maximizing glide. Sole ripples are the ones from the straight line motion of each immerged body. If we are thinking about innovation, it is like fine tuning, muscling and accelerating a core new product portfolio time to market for instance. With perfect alignment with the strategy, and close control of the techniques and metrics. The coach watching from the pool bank provides surgery blade analysis: separate each exercise, each individual, and develop sharp talents. So it is possible to switch drills from one lap to the other and cover the 18 points of the proposed list. Adding just one simple dimension by moving to the "Open water" discipline (a newly olympian event) is pushing the square control framework to new boundaries and coaching points, kind of "fractal versus square" path. With much more ripples effects to watch out, analyze and work on.Designing the innovation pool a very different shape and taste. Innovating Innovation : Q1.Did your sponsors created “stretch” goals for break-out thinking? Social technologies are not so much about adopting what is already an innovation. Motion is about daring to test and use them in ways as different as possible compared to the previous sharing channels and processes. This means first avoiding to reproduce and fit them in the established hierarchy and associated patterns.It is to inject much higher energy and efforts. A clear bias of social communities is a daring energy that is expected to contaminate peers. FJL’s experience in Lap 2 is here. Coaches test new strokes in Lap 3, but they also test young recruits’ capabilities to go faster than previous generation veterans by stepping on their shoulder to look higher and further. Details on FJL’s experience in Lap 3 is here. "In/ In" : Q3. Did your coach(es) accelerate the process through rapid prototyping, simulation...? Freestyle John Linchpin : Yes, and Lap 3 is often paired with Lap 1 stretch goal exercise. I remember at least 2 different forms of routines . The oldest one is going by the code name of "G76 WAVE", for Waterproof Armored Vehicle Exfiltration " Scary isn'it ? In/In : Q4.Do your coach(es) and sponsors upgrade the skills of every individual? Freestyle John Linchpin : Not yet. But I am lobbying to convince Top sponsors to partner with Bluenove about its soon to be released "Innov'Nation" serious game. And open the game to all teams, from "Elites Squad" to the "Local Hall of Fame" engaged in everyday innovation. The coaching plan that is explained in the lap 4 is available here with a filled example ofFreestyle John Linchpin case. This can be used as a Talent Development Tool, designed for innovation exposure and experience path. In/ In : Q5. Do your sponsors make experimental capital available to one with a bright idea? Freestyle John Linchpin : Money ? Available to anyone ?...Hum...Joker?.... Lap 5 kind of exercise did happen in the past. It has been the case for myself. I don't hear much about it as of today for individual ideas.Fund raising does happen quite quickly for collective ideas, already sold to credible actors with influence, and/or selected through official processes and awards kind of contests. To butterfly on the wings of internal business angels is not a given and easy access.Accreditation, ID proof and track record credentials are requested to get to the open innovation surf spot ! In/ In : Q6. Do your sponsors or your coach(es) de-risk innovation through low-cost experimentation, partnering..? Freestyle John Linchpin : You are funny. Lap 6 is my favorite drill. Lean to the bone. No silicon floating skins suits allowed any longer. You need to be slim and fast is the only way to get a chance to enter any event since 2008. You grab start almost naked. Because Low cost is overrated.And way too expensive according to sponsors! Partnering has sometimes being shaved for better glide. This is especially true for consulting and out-sourcing.I joined only one kind of Partners Boot camp on a R&D program in the very early 90's. and time of rookiness. I know that more globally sponsors and "elite squads" coaches innovation approach has relied for many years on a solid network of around 100 partnerships.This is covering needs ranging from scientific collaborations to research joint ventures. These partnerships with universities, public and private laboratories and other industrial groups have increased the group's innovation capacity. In/ In : Q7.Do your coach(es) deploy innovation tools throughout the organization? Freestyle John Linchpin : Lap 7 has been introduced recently because it requires props.Like board for kicking.You can do without but it is a different breath-taking drill. We call it Wedoo. This is the in-house name for the Google suite. Nothing fancy and different from competitors but I experienced a boost in spirit and efficiency in the collective efforts. I volunteered for the test group back in 2008 and envision the potential.Like clearing troubled waters. Racing design Goggles (no typo) with powerful fog repeller coating. I am very sensitive to this feature.Optifog is the new category currently grown as a start-up innovation into my company. Clear vision on long distance and long term is a must for innovation. The decision to deploy globally the Wedoo Suite has been taken late 2011, despite the fact that many were still struggling and whining about a complete change of stroke, with temporary loss of familiar precision benchmarks, and a radical flip-over on the wall of the basic working and communication tools.Including executives sponsors. This was a very courageous decision taken by the coach. In/ In : Q8.Do your coach(es) and sponsors encourage you to carve out space for innovation? Freestyle John Linchpin: Yeap. 3D it is called ! I do coaching too. It is a very efficient way to be a better doer. Observing and leading talented recruits is a powerful self-development activity.And in such context I train my team according to a motto proposed in the years of 2001 to 2003 to the US team members by a master coach. A "Dream Dare Do" 3-tier ratio that I discuss with each individual according to its development stage (rookie of the year or master veteran). Average starting point being "10/30/60". I use it to free up between 10 to 25% for "Dream" time and resources for the guys to envision, project, get ambitious, about something innovative for themselves, as an opportunity door opener. Sponsors are aware of this contract. Practically Lap 8 can easily become a sophrology session as well as a 10 km open water swim on a gorgeous lake.Something driving new sensations or opening eyes for next career. I have to admit it is not at generalized and most of my colleagues argue they do not have this luxury.So there is an hotel for improvement.Lots of rooms! In/ In Q9.Do your coach(es) organically grow “communities of passion” around promising ideas? Freestyle John Linchpin : Sure we do. Water we progress trough is heavily mineralized with passion and community flavored from as long as the old pools were built back 19th century. It has been slightly more difficult in the last decade when training for the international circuit. Moving up from regional to global is a stretch ! Competition has turned more fierce.It used to be 100% internal, then it became more us, the teammates against all of the others. Recently, since it is global arena, we had to switch again. The only way for coaches to mimick the pressure we get globally was to link the highest talents from each regions.And even partner with competing groups to integrate promising elements into the workout training camps. That’s the friendly co-opetition challenge, understand the power of synchronized underwater sonar to reveal the way to go, to new innovations faster than the pilot fish-guy next lane breaking in. The recent example is from Q4 2012 with the IT department being emulated by a "emerged out of nowhere" community of internal non IT developers (digital natives) exchanging high level tips and codes to build their own collaborative tools. In/ In : Q.10.Do you coach develop clear metrics for innovation? Captors and sensors are key words.Both are beyond the traditional "Key Performances Indicators". "Distance" and "Time" remaining the 2 KPIs and bottom-line measurement of progress.Coaches are guiding through the laps and challenging goals, as in Lap 1, on every moment and micro-details during training, as opposed to one big goal. You can grow muscles and move faster, but so grows your drag,preventing to scale up.There is a need for multi-criteria strategy. A -you want to be sure that in your team (s) will emerge successful swimmers, you want all to be familiar about the basics . That’s one of metric that coaches will look at . It’s a way to find out if basic workouts are needed to innovation steps understanding... before getting into leading edge thinking. B, it’s a comprehensive reference to the chrono. Our coaches - and all engineers - have access to the credentials On a 5-year reference period, one can check the records for each swimmer validated by the coach - the innovation card. So, at the end of the season, we can review the metrics for overall contributions.Sensors detect beyond records, every new element (stroke technique, speed management, underwater analysis etc..) . And impact. C, consider the ratios of swimmers that distinguished vs. your pool of swimmers. A capture of innovation chronos to encourage others to surf the wave! In/ In Q11.Do you sponsors create widespread accountability? Freestyle John Linchpin: Sponsors....I’d rather tell you Maestros please! They try hard to get us all "in-tune".This was the june 2012 tagline for an international boot camp I joined as 600 mates in a nice place of the french silicon valley. We were trained by four external coaches to sing a south-african miners song. Maestros are essentials in our incredibly large and growing ocean of arabesques... . And a few days ago we’ve actually had a very neat illustration of syntonic waves flowing worldwide. It’s the innovation primary aquabeat provided for vision and diffusion to more than 45,000 swimmers. Contagious, isn’t it? In/ In Q12.How does your sponsors knock down bureaucratic hurdles? Freestyle John Linchpin :I would say : They don't.However that is positive.How come ? Are you familiar with the " wu wei,無為 "/Do not act " concept?. This is what I experienced. Sponsors do not do. So nothing refrain you from finding an innovative way around the block. 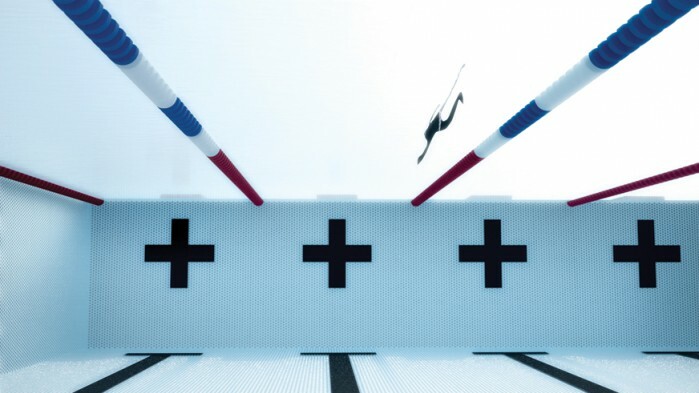 It is like Lap12 drill where your work and re-work the diving leap and the underwater sinusoidal progression so you get ahead without your efforts and energy being noticed from above. Hurdles are here. Especially during budget times season. But with smart moves you can roll under the waves, and sponsors do not stop your action as long as it is compliant with the company's principles. In/ In Q13.How do your sponsors make innovation a component inreward decisions? Freestyle John Linchpin: First, I’d like to mention that we have a medley of swimming strokes, sponsored by international top-level coaches as well as local masters. Swimmers can enter tthe " Tropical Eyes Hurricane" wave rides, or to the Innovation "Enginnovation" awards race in teams, they choose to be rewarded as Innovative person or team of the year. The innovation person of the year is nominated by the coach after having demonstrated consistent effort in supporting our innovation process through various workouts: authoring innovation cards, empowering others by facilitating creative sessions - note, that’s a good way to get your swimmates along - or being an effective contributor to these. If you ask me, I see them more as a message from coaches believing in their athletes - than a winner-buzz event.Though recognition is important, what arises from the open water pool is drawn from the unpredictable. In fact, rewards or comps are one of the existing wetsuits to reveal mind illuminations and thrive breakthroughs. In/ In Q14.What do you do to involve customers (supporters) ? Freestyle John Linchpin: What about clinical test for the development loop? Some science in the performance analysis. I did not participated directly into it but got the benefits of its as an early adopter innovation wearer. It is patented loop with external endorsement by physicians. This kind of pre-qualification series is called "LiveOptics" -The Live Optics program, established in 1993, is the only program of its kind. It makes it possible to test all Essilor lenses under real-life conditions, over several weeks, before they are launched on the market ocean. All new solutions are tested on real customers. Simulation deliver computed magnitude of what is called "swimming effect" for instance (motion sickness vision) is specific condition, but it is confirmed live with supporters walking up and down real stairs to cheer in tribunes for instance. I witnessed also the transmission of buzz power to the crowd of professional customers creating technical demo videos about new features. In/ In Q15. How do coach(es) help you to manage the tension between operational innovation goals? Freestyle John Linchpin: That’s another pair of goggles augmented reality check. Open water ponds are foggy in the morning, outdoor pools too. You need to keep in mind the level of competition you’re training for, and foresee the upper steps on the innovation path. Season is long and succession of seasons is a medium term horizon. It takes time to get muscles and technique fit for efficiency.It takes fine-tuning to be ready for D-Day. In/ In Q16.How do coach(es) share innovation insights? Freestyle John Linchpin: Oh, the one that can end up in heartstroking miles if you happen to swim backward. You need to develop flexibility on heavier muscles and it is neither a piece of cake, nor painless. We-doo have some simple home-made warm-ups mingled in a nice mix of individual thinkings. First stretch, our engineers alltogether: that’s our Innovation Day. Hundreds of thinkers reunited across teams or department boundaries for a full-day workout. Alltogether, time to swim collective and cool pace. In/ In Q17.How do coach(es) improve the quality and quantity of innovative ideas? Freestyle John Linchpin: back to me "EyeDeaStorm" innovation event testimonial : 3,000 talents have been identified and contacted, 0ver 300 daring to enter the selections.. That was adressing the question of quantity. 30 called to the finals.6 being filtered and refine through a "Bluenove" process leveraging Diversity and Medley style. That is for quality.As of today a one shot to be repeated as a drill. In/ In Q18.How do coach (es) ensurefforts take advantage of the diversity of experiences, skills, and values? Freestyle John Linchpin: Do you happen to know that Mix Medley has just been introduced in 2012 by International Federation ?Yep, teams of 2 women and 2 men, order being open tactical options. I am welcoming a senior R&D Knowledge Management new talent into the pool.She will be focusing on Collective Intelligence experimentation and development. She is transferring from the R&D division where investments are carefully selected and aligned, and highly visible and discussed with the overall organization. She will dive into our smaller and more agitated and troubled waters, where innovation is closer to the local rapids. For over a decade I had the chance to be part of mix teams, where business and engineers wizards were sharing the same job descriptions. Ten years earlier, in the 1990's, into a former division now spinned off as an independant company, I was exposed to the lead of a creative team .Call it a stretch as far as diversity of skills and value. But I have dream : that someday we integrate remarkable skills such as Asperger austists profiles. So looking at the surface, and slightly under and above, we can establish this first census and first order in/in ratio . To go to the full squared ratio, we need to look into each square, and to establish a derivated score, about how much we are applying the lever in a classical way, or if we can estimate some innovative insight on each lever. The road-map (or drill log?) to push innovation into any organization, business or non-profit, community, team is available. With different path options. 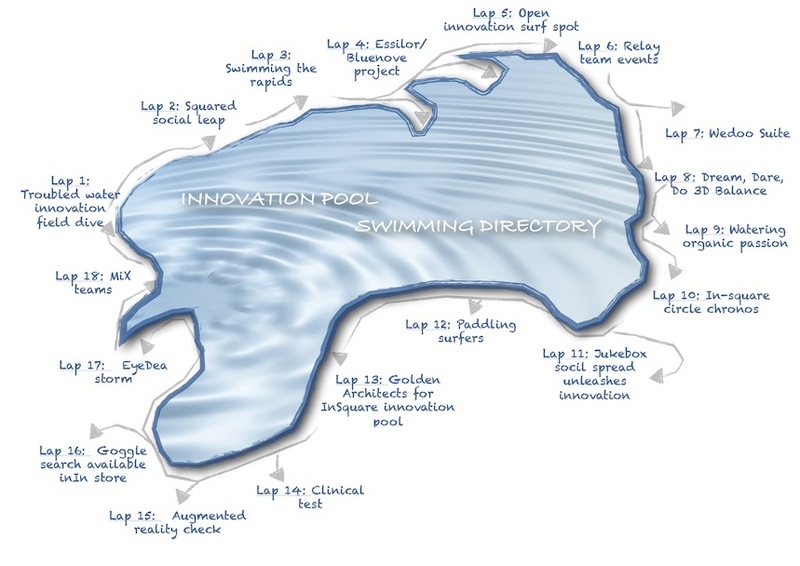 Learning to swim the innovation waves means to train in the pool, race eventually, then get out of squared surface and move to open water and open innovation where lanes give on to multi-direction benchmarks on some distant point, only flagged as a vision, yet still limited to the visible surface. The solution is not to consider a menu list on which to cherry-pick the group favorite dish or path, or lap. It is to get out of the too-comfortable zone where most competitors already evolve daily. It is to practice a diverse set of exercises and chain them timely to avoid comfort and routine. It is to get out of any comfortable zone where most competitors already evolve daily. It is to practice a diverse set of exercices and chain them timely to avoid comfort and routine. In the routine itself. Scary Square, isn'it? It is to train in the pool, then race eventually, than get out of squared surface and move to open water and open innovation where lanes are giving up to multi-direction benchmarks on some distant point, only flagged as a vision, yet still limited to the visible surface. Medley of individuals and styles are a good organization for this first level of team challenge. It will drive the score and in/in ratio up. We also translate onto the map of the world of concepts, and on the solid lands of real business life experience.With some metrics in order to help managers, coaches and sponsors to measure some impact or return on investment.We provide easy to use but wide spectrum range assessment captors and tools. 1.a practical tool that can be used to assess any company, organization or individual ratio, defining the capacitiy of leveraging more than one innovation lead. 2.a conceptual frame linking the 18 leads on one end for the surface analysis and extended ideas. 3.an example for an individual innovation path design. 1.leading to related stories detailing some of the most interesting laps. 2. plus a bonus footage to a complimentary hack digging in the swimming effects as a multi-dimension theory. A kind of Directory's cut DVD feature.This extra "18 Black Holes Hack" will push it beyond reality, combine the different leaps or add dimensions in a thought experience. Rated PG (Polarized Goggles) 18+ laps, will be of interest for the highly motivated, to scrutinized under the surface, through bright and blinding glare from this first reflexion.Polarized filters do increase acuity and contrast..
A.Score definition and scale : The simplified scale with steps of 0.25 are linked to the question of each pink square from the leads given within the Innovating Innovation Challenge. For an organization (regardless of its nature) that is not yet taking advantage of the lead, that means where practicing the specific lap is not an identified mean of pushing innovation,score is Zero. In/In Ratio : The simplified scale with steps of 0.25 are linked to the question of each pink square. But we look at the drevatdd approach, that is to say how much approach is just a cut and paste of some typical benchmark or innovative on its own, so innovating on innovation. For a real life observation where veterans, R&D, Business development, Technologies developpers are exposed to a processes in the scope of the question / lead, even in a "me-too way" , and more on an exceptional event than on regular practice, score is 0.25. For anything less tangible, and/or for laps with a first level score of zero, the ratio applied will be zero. The 80/20 rule would lead us to select 3 out of the 18 leads to try to get the low hanging fruits of innovation initatives. Stretch goal would be to shoot for 10. However the consensus approach would likely quickly refrain innovators from innovating in multi-direction at the same time. Through the years, one individual may have the chance to experiment most of the dimensions, assuming he stays within the company, or find another one engaged in the same search, and he keeps enjoying testing. It is no yet deliberate talent development path designed by some creative HR. We can wish it will someday be the output of right brains collective effort with innovation oriented agenda. Freestyle John Linchpin exposure to innovation levers may be evaluated with a score of 11,5 out of 18. In/In ratio is in the range of 0,55. Note that Company level ratio would be different and not the sum of the average of each individual. 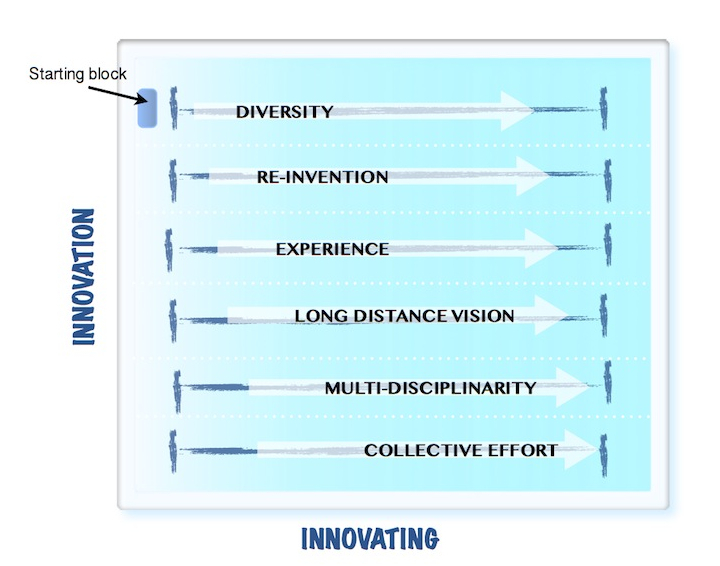 Dispersion among all collaborators, or for sub-sets such as R&D or marketing specialists is likely the most relevant captor for innovation accountability spread. With over 10 years to go before any retirement perspective, so with Master Bedroom for improvement.I bet he would argue he experienced others that are not in the Innovating Innovation list! Lesson 1.Every entrepreneur is taking risks.Fuel for existing is to dare.Hope overates objections. For an established company it is more common to avoid risks. The consequence is to apply only proven solutions and practices.Even about innovating.It may turn a wet promising soil into a dry land. Lesson 2.Collective intelligence may be develop within a safe environment.Safety allow daring individuals and groups to dive.Like a nice intellectual exercise.Some lab trial. Lesson 3.Smart companies will benefit from setting up the environment for individuals to recycle their own talents and creative process. Innovation pipe will mechanically grow by training some individuals or groups as tri-athlets innovators, or train all on the paycheck in order to build a large team covering all disciplines on the field of innovation.To hire talents for specific skills, to be immediately used on well known recurrent issues, or to control the maintenance of successful business and industrial processes is only efficient for a certain time. This is not designing sustainability, as controlling maintenance may lead to the exact opposite.Loss of momentum, lagging from competition pace and acceleration, and finally side fall (from bike) or drowning (in the pool). Lesson 4.Co-operative intelligence is the upper level where more "unsafe conditions" are the ultimate incentive for seeking unheard proposals, potential to go back quicker to the safe side, or even another new surface.Unsafe conditions may be replaced by stretched goals in terms of timing or resources. Lesson 5.Changing sequences can move a bottleneck on a collective agenda as simply as in an industrial or an administrative process.Experience the value of daring and moving the lines is a workout that can change your entire career.Not because you will innovate for every challenge, but because you are confident it is another option. We consider such multi-leap effort for a company to be a dedicated committment to innovation, a stretch goal, and daring step innovative by itself.Low gravity Giant Leap on the moon was only dry land exercise. Azra Brankovic, narrative coaching and freestyle tune-up. Matrix and visuals helps : We encourage highly to have a deep dive and sub-aquatic exploration of the attached powerpoint. There is also a spreadsheet (pdf) with an easy to use self-assessment to calculate score and ratios for any individual or complete company, about how much the innovation process is taking full benefits of multi-Laps routines. It will likely light up some of the obscurity you may have encountered in this difficult hack topology. The 2 videos are only to entertain and illustrate how much surface can be a world of innovation by itself...and a surrising but powerful detailed metaphor. When you do not yet have a coach, you start by yourself, or by coaching your own team.So to be transparent as a beautiful open water spot in Slovenia or Thailand, I did rate this story with the eye of the guy on the bench of the the talent pool of innovation. Until the wisdom of the community will kick in and build its own multiple sensitivity opinion and rating and provide comments on specific expectations or request for explanation. I do not recognized my original story and this is an exhilarating feeling. A proof of concept.Big thanks to each contributor.I wish this will inspire some MIX members.It is our gift to the community. We believe it is fair and loyal to the text of the Manifesto. We are in final tuning. It is OK an open for comments. We do welcome diverging opinion as much as questions about any element. As I said : do not be shy. We do welcome Mixers diverging opinion as much as questions about any element. Why Hiring a Chief Learning Officer is Key to Success?